Benjamin just loves the new stools I bought last weekend. He can’t get enough of sitting up at the bench and helping me cook. Here he is chopping the carrots for dinner. Apparently I didn’t chop them small enough! That is blunt cheese knife Ben is using – it has to be hard work!! Ben loves to help cook. Well not really help and not really cook but make a mess and eat the mixture. 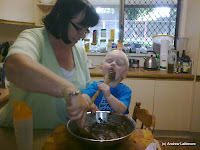 Both of which he was allowed to do while cooking with Grandma. He has her wrapped around his little finger!! This morning I made a Chocolate Muffins. Ben decided he would give me a hand…… well kind of. He did manage to flick the ingredients all over the kettle and coffee machine. He had a bit of a taste but was more taken with the buttons on the coffee machine. He was however very excited at the prospect of washing the dishes. He had the concept of putting the dish in the sick and moving it to rinse. But when I said ‘wash, wash’, he lifted his hands out and pretended to wash his hair (very cute). We all joined in helping him this morning. There was water from one end of the kitchen to the other. GREAT FUN! !